When it comes to your program data, you want unfettered access and powerful analytical reach. The outcome of your educational strategy depends on the integrity of the insights that you use to make your decisions—and that means how your data is collected, maintained, and analyzed is of utmost importance. You can’t afford to compromise on the truth about your program’s educational outcomes. You endeavor to give your learners the best educational experience possible and if an aspect of your program is no longer meeting their requirements, you want to know. That’s why EthosCE Analytics provides CME program directors with access to advanced analytics tools that allow them to tailor every detail of their users’ experience to their specific educational needs. The EthosCE Analytics suite offers deep insights into the motivations behind learner behaviors and the causes behind persistent educational outcomes. 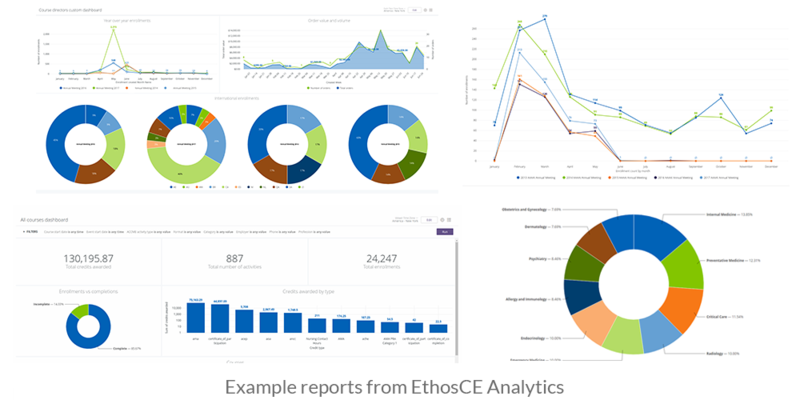 EthosCE provides a broad range of analytics tools that unlock the power of program data from the inside—giving you unprecedented access to learner behavior and educational outcome insights. With EthosCE Analytics, you can slice your data the way you want, creating segments that may reveal a comprehensive portrait of your students’ learning styles and motivations, along with potential barriers to their success (such as individual knowledge gaps). With enterprise-grade data access, your arsenal of insights is just as big as your data. Will Your Data Pass the Stress Test? Cleanly derived data is essential for accurate program assessment and evidence-driven curriculum development. EthosCE Analytics automates data collection, warehousing, and analytics, limiting the prospect of human error. If your critical program data is collected manually, you may find that data gaps, numerical inconsistencies, and inflexible data segments hinder your strategy-building process. Will your current data collection method pass the “stress tests” of program troubleshooting or strategy creation? Does your current LMS offer integrated analytics and automated data scraping? Are you able to create custom data segments with a few clicks? Can you compare real-time and historical data segments easily? Do you have the ability to use select external data along with internal program feeds to develop insights? Can you easily review aggregate and individual learner data from the same dashboard? If you answered “no” to any of these questions, you may be devoting time and resources needlessly to a generic LMS system not suited to the demands of a growing CME program. EthosCE not only makes it easy to find the right insights, we also simplify data sharing. 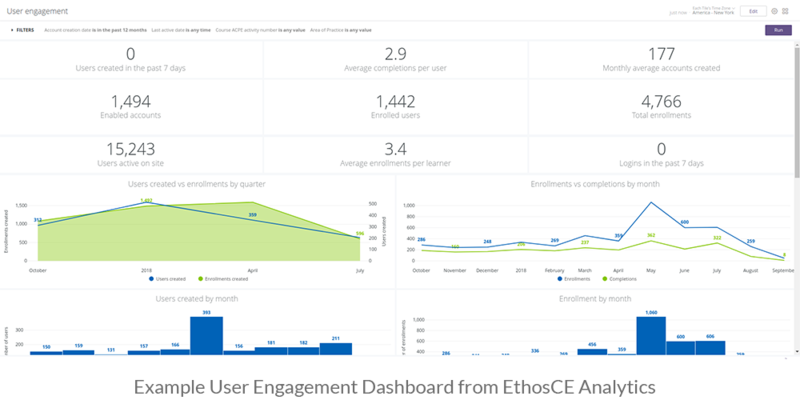 On a single dashboard, EthosCE provides aggregate and granular data on learner behaviors, LMS interactions, learner assessment performance patterns, and learner feedback among numerous other datasets. With data visualizations, you can instantly share all of your insights across the organization with stakeholders. Our advanced data visualizations allow you to summarize complex information and highlight key data points in a simple, elegant format. With data-rich visualizations, your team will always have the insights that they need to support your development of an evidence-driven CME practice. Generate performance analytics reports that your team will want to read. EthosCE Analytics also offers the option of customizable reports. With our reports, you can easily integrate your data within an elegant report template and customize as needed to emphasize a selected theme. Our professionally designed, reader experience focused report templates highlight the content that matters and communicate your message effortlessly. Our templates eliminate the time your team might spend designing new documents, allowing you to generate a report with a few clicks. It’s time to put your data to work. As a CME director, you probably can’t spare the time required “help” your generic LMS to behave like a CME management platform. That would require developing a slew of workarounds with a web developer, and a lot of manual performance analytics data collection and spreadsheet wrangling. With an enterprise-grade LMS, you won’t need to help your platform do its job. EthosCE offers a full-featured performance analytics suite that’s built to scale with your program effortlessly. It’s included with our LMS because we believe that high quality data is an essential ingredient for CME success. Why? Because for more than 16 years, we’ve helped CME directors build successful programs that scaled beautifully. With open access to programdata, a strong analytics suite, and the tools to streamline critical administrative tasks, CME programs of any size can thrive, even in a highly competitive industry. Ready to see how effortless (and powerful) advanced data analytics can be? Connect with us for a 1-on-1 walkthrough with one of our specialists and watch us put your data to work.